Hotel facilities include a safety deposit box and room service. Helpful staff can offer assistance with shuttle and ticket services. A day trip can be arranged at the tour desk. Laundry services are available. For relaxation, guests can take a walk in the garden. Guests can take in the beautiful sunset while lounging on a deckchair or hammock. 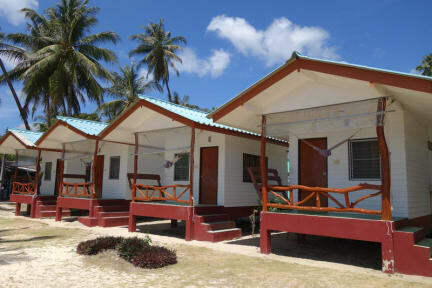 Diving and canoeing can be enjoyed at the beachfront accommodation. Authentic Thai dishes can be sampled at Green Peace Restaurant. The restaurant also serves Western cuisine. Guests can enjoy a variety of cocktails and refreshments at the bar. A snack bar is also provided. 3. Reception as well as the restaurant is open from 8:00 am to 9:30 pm. If you arrive earlier or later please let us know. 4. Both cash and credit card payments are acceptable upon check in at the property. 5. At least 72 hours advance notice for free cancellation. 6. Please not that we do not have twin beds. Only double beds. Extra beds are not available. -Full Moon Reservation: A minimum stay is 4 nights.